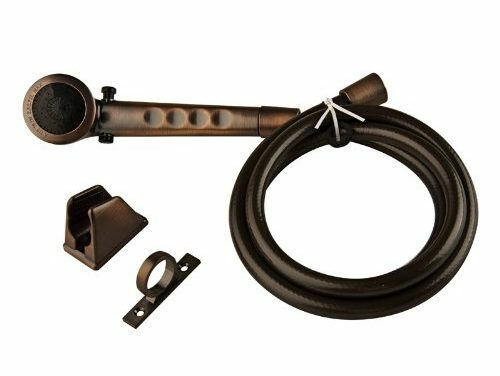 If you’re a camping enthusiast who frequently travels in an RV, then investing in a good shower head would make your trips even more enjoyable. You would enjoy the luxury of taking long, warm, high pressured showers! As you know, most standard shower heads for RVing are miserable. Some are made from cheap plastic and have no pressure whatsoever. 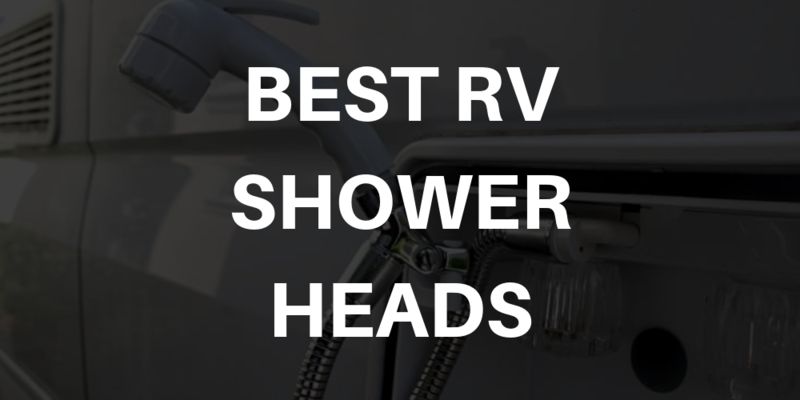 So, to make sure you never have to compromise, we’ve compiled a review of the top 7 rv shower heads that you can count on to enjoy the therapeutic bath that you (fully) deserve. Renowned for its classy, stainless steel exterior, this handheld showerhead is sure to bring luxury to your RV. First off, it boasts a patented design which emits high pressure against lower pressure water pipes. Indeed, the unit has a built 2XP turbocharger which complements your existing water pipes. On top of that, it comes with silicone rubber jet nozzles which prevent a build-up of minerals. That way, you can easily clean the surface even with your fingers. As far as durability is concerned, this unit boasts an ABS engineering grade plastic. This is a high strength piece of equipment that’s also heat resistant. Therefore, if you’ve been concerned about the durability of your showerhead, this one is bound to ensure you never have to worry anymore. Another awesome thing about this unit is that it comes with three head settings. You only need to play around with these settings to adjust the pressure level of your water. For instance, if you’re looking to relax your muscles after a long day out there, you can opt for the pulsating setting. Likewise, if you’re simply looking for a relaxing shower, you can always settle for one of the two lower settings. So, the Yoo.Mee is the kind of head you invest in to enjoy a slight touch of luxury but without breaking the bank. Most importantly, it has all the basic features needed to overhaul your current, underperforming, factory-made system. One thing that sets this unit miles ahead of the competition is its ability to add more pressure to your water. On top of that, it features a unique line of technology which sees it increase the oxygen levels in your water. As you know, a high oxygen concentration in your water can mean a lot to your health. In fact, it’s therapeutic. 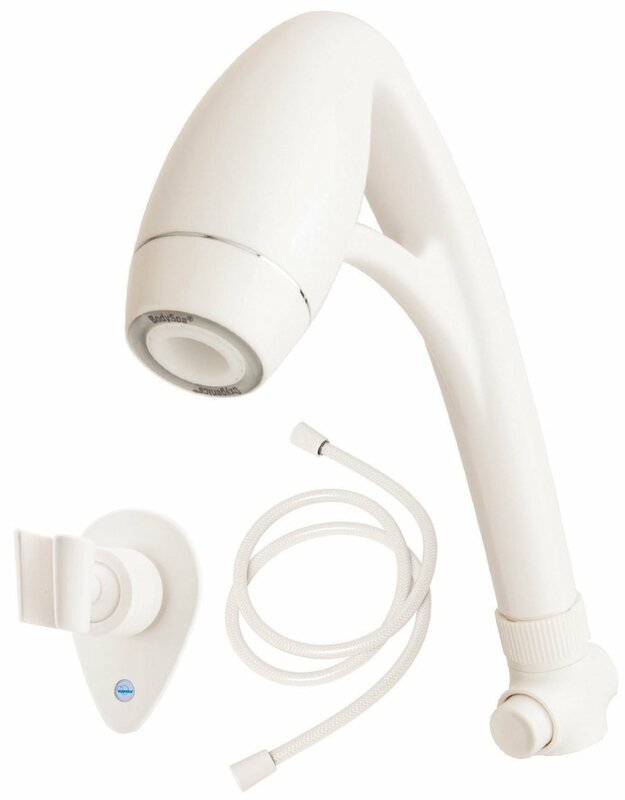 Moving on, this handheld showerhead includes a wand, comfort regulator, Teflon tape, and 60-inch hose. And to make sure you’re never stranded, a convenient easy-to-use set of instructions is included. Armed with a self-pressurizing technology and admirable water-saving benefits, the ETL head stands out as a good deal for the discerning RV owner who is ready to pay a few more dollars for quality. 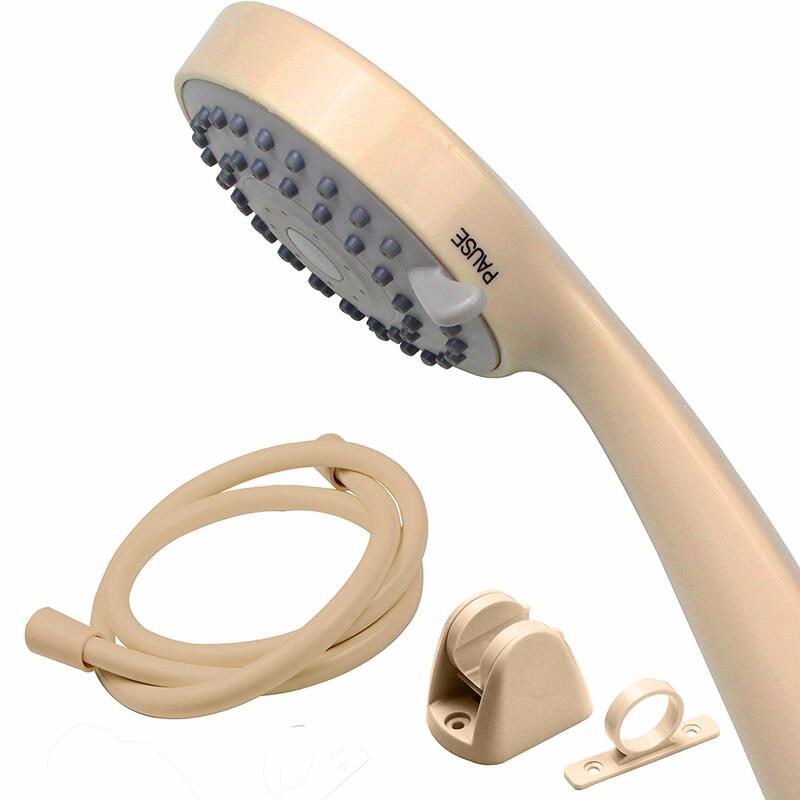 And most importantly, the showerhead is not only good looking and usable but also durable. Your comfort is pretty much guaranteed every minute you use this head. A closer look at it reveals that it presents you with comfort control adjustment features which enable you to adjust the unit’s functionality from soft to stimulating. Don’t let its unique design fool you, this seemingly tiny shower head is pretty big on power. Indeed, its manufacturer has designed it to use a special technology that increases water pressure and widens coverage. Its streamlined design ensures that no drop of water goes to waste. Of course, that can help you extend the life of your RV water tanks. As you know, you really have to be calculative when you have to put up with a limited supply of water – and this shower head helps a lot in that. Moving on, the model comes with a special valve, known as a SmartPause valve, which helps minimize water flow during soaping. And unlike other units that tend to lower water temperature in such instances, this one is renowned for keeping water temperatures consistent. For longevity, the Oxygenics 26481 boasts non-stick internal parts. These come in hand in preventing clogging and mineral build up even when the kit is used to pump hard water. The only major issue we could pick here is that the shower head’s hose is made of plastic. It doesn’t hang freely and instead rolls out into a messy coil. There are so many great things about this shower head but the greatest of them all is its easy-grip wand base. This is convenient to use and can go a long way in helping you save every drop of water in your water tank. 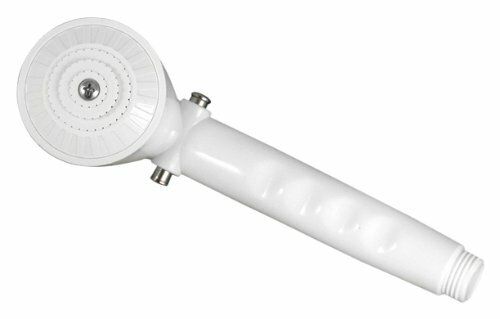 So, if you’re frustrated by ON-and-OFF switch showerhead models, this one is bound to impress you with its unique design. In fact, its matching, flexible hose provides it with a pretty modern look. Quality-wise, the Dura Faucet provides you with premium grade resins which are fade-resistant and corrosion-resistant. This kind of finishing isn’t just good looking but also highly functional. With a hose length of 60-inches and a flow rate of 2.2 gpm, this unit delivers decent levels of water pressure. One rather strange aspect of this shower head is that it’s pretty light in weight. So, if you’re shopping for a heavy-duty piece of equipment, or brass and chrome, you might want to look elsewhere. That said, this unit is so well made that you may not realize that it’s mostly made with plastic parts. As such, it is great for RV use but not stellar for home use. To sum it up, this Dura Faucet unit comes with an all-new hardware including rubber seals. And what’s more? There are different color varieties available and so you can always choose one that best matches with your rig’s decor. You would no longer have to struggle to find the water to rinse off your hair all thanks to the PIH’s full wide spray. In fact, it comes with a direct setting which enables you to enjoy a consistent supply of water at high pressure. Its mount is pretty well designed and fits so nicely on most average-sized RVs. You wouldn’t need to struggle to fit it into your tiny shower cubicle either. Perhaps one thing that makes this a relatively popular option is the fact that it features an upgraded 2XP turbocharging engine. This works wonders in boosting water pressure and also in conserving water. That’s all thanks to its ever-reliable spray shooting mode line up which features options like powerful shooting, pulse massage, and pause. The pause mode comes in handy during soaping. To this end, one thing we’d like to note is that this unit has a remarkable ability to keep water temperature levels consistent even after switching to the pause mode. Another plus is that it regains normal pressure quite fast especially when you shift from pause to powerful shooting modes. In our opinion, this is a great option to settle for. Its water stream is pretty generous. However, its highest pressure level isn’t as forceful as we’d have wanted it to be. 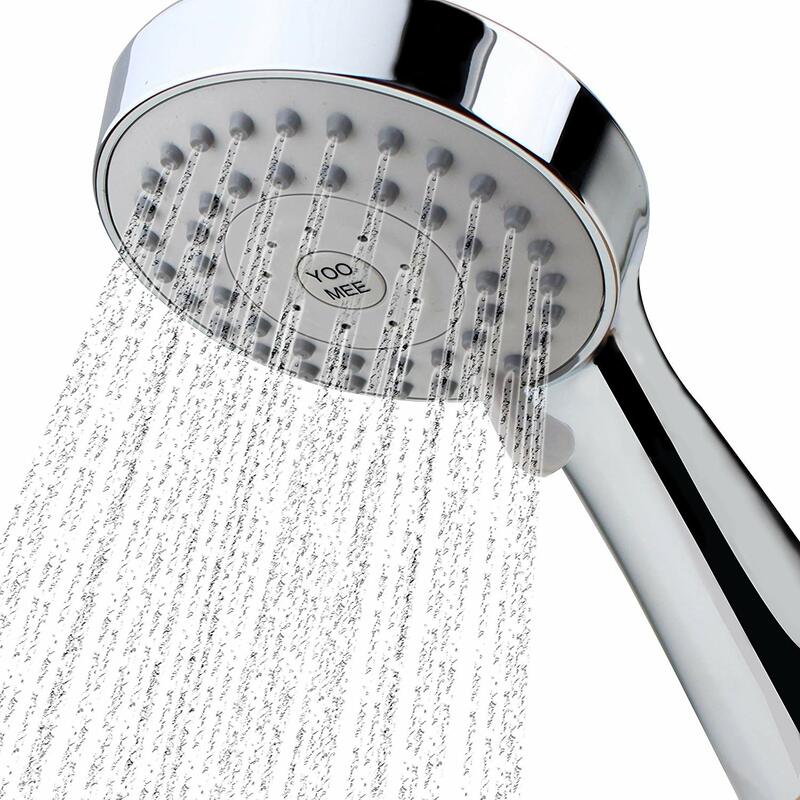 Besides that, compared to other showerheads used before, this one seems to use a fairly large volume of water. 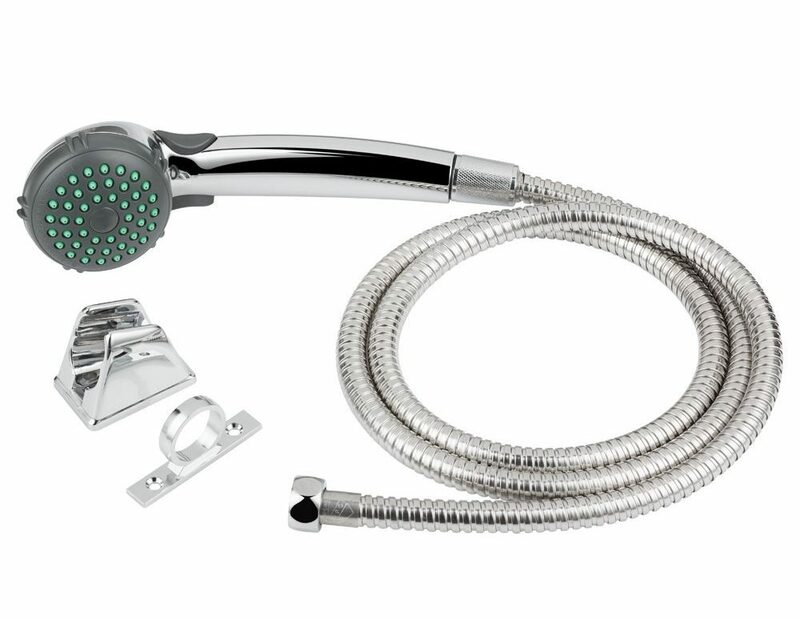 For an affordable, hassle-free shower head, the Phoenix PF276015 would be a good bet. Although it’s made out of plastic, it doesn’t fade or turn yellow easily. A closer look and feel of it reveals that it’s made from a high-quality plastic and so far, different reviews seem to suggest that it’s quite long-lasting. The Phoenix’s water spray feels good too. It has a relatively wide stream and produces tolerable water pressure levels. That said, this unit isn’t fancy. So, if you’re looking for a cheap replacement that probably works better than the original, this one would fit the bill. However, if you’re looking for luxury, you probably would need to go for something else. And because it’s made from plastic, it may not last for too long especially if it bounces around a lot during travel. But to be fair, its unique design seems to make it hardy enough to put up with a little more abuse. What about its water consumption habits? Well, on a scale of 10, we’d confidently give this a score of 8 in water conservation. In fact, it comes with a pretty handy shut off valve. On top of that, it maintains a pleasant flow of water. However, if you use hard water, you may need to disassemble it every so often and soak it in a decalcifying liquid. Luckily, it’s pretty easy to assemble and disassemble. You don’t need to pay a plumber to get the Dura Faucet DF-SA400K-CP up and running. That’s because the holes in its brackets are designed to line up with your existing ones. So, you can easily get this installed in a few quick minutes and you won’t even need any tools for it. However, some people prefer to add a Teflon tape toward each end just to ensure that water doesn’t leak. What’s more? Its nozzle pattern is pretty impressive. That’s in addition to the fact that the hose doesn’t twist even when you adjust the ON/OFF valve. In general, this head seems pretty well made. You can even add it as part of your luxurious collection of features. And best of all, there are different colors to choose from including chrome, bisque parchment, brushed satin nickel, oil rubbed bronze and white. The pressure level of your water doesn’t matter either! The DF-SA400K-CP’s water stream is pretty generous and has all the power needed to enjoy a warm and fulfilling shower. Moving on, its wand comes with a comfortable grip. That’s in addition to the presence of an easy-to-access flow control valve switch. You can conveniently use this switch so you can conserve more water than you would when using a traditional shower head. A common complaint with showerheads is that a vast majority of them come with cheaply built hoses. So how does the DF-SA400K-CP fare? 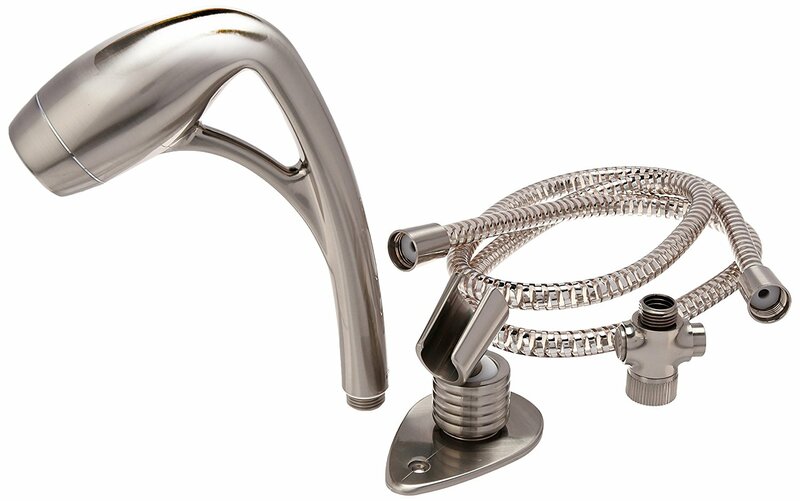 Well, it comes with a high-quality stainless steel hose which is pretty much all you need for a long-lasting use. Most rigs come with factory-installed RV shower heads. However, these units are, more often than not, cheaply built and with limp pressure at best. Some have poorly built valves that have the water flowing wide open, so you run out of hot water even before you’re halfway done showering. Sounds familiar? Well, as we’ve seen in the reviews above, you don’t have to put up with a miserable factory-installed shower. There’s a wide variety of replacement options available at your disposal. All you need to do is find one that best suits your needs so you can dump that old piece of junk in the trash. 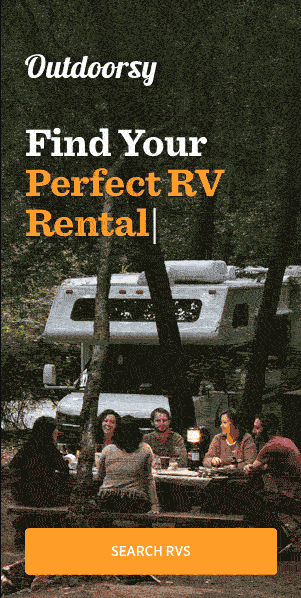 This way, you can get more value for your money and focus more on enjoying your camping escapades and less worrying about a malfunctioning RVing showerhead.